In the early 1980’s I lived in Amsterdam for three years. My partner and I were itinerant workers and squatters, living in happy poverty in the dreg ends of hippy-dom. After a while I grew tired of this way of life and wanted to do something more meaningful. I had failed as a painter and now I was failing as a dish washer and night porter; I decided to come back to Liverpool and see if I could write the Great Liverpool Novel – or at least a few poems I could recite in the pub. ‘Zeedijk’ is an attempt to write about my time in Amsterdam which is something I have struggled to do for nearly thirty years. I began by trying to write a novel because it seemed to me that only a novel with sprawl and swagger and drunken abandon could accommodate the wildness of the story. In the 1980’s Amsterdam was incredibly potent culturally but it was also politically radical. There was a great sense of anarchic possibility on the streets which frequently erupted into protest and riot. On one occasion the squatters movement took to the streets and directly challenged the authorities; 2,000 squatters – or kraakers – took to the burning streets which resulted in the army being brought in. There was a curfew, armoured cars patrolled the streets; there were mass arrests and a tram was set alight in Museum Plein. My partner and I spent three days on the streets immersed in this mayhem. It was like a belated coda to Paris 68. The activist group Anti City frequently took to the streets. Paradoxically this revolutionary fervour led to the closure of the squats and probably to the closure of that whole way of life. After the police closed down the lucky Luyk squat people began to move on. At the Aliens office I was give 28 days to get a full time job or leave the country. We got out of Amsterdam just in time because soon the revolutionary squatters would soon be replaced by property developers and Amsterdam would cease to be a place of anarchic dissent. So I tried to write a novel but I failed. I couldn’t get close to the memories – that is to say that I couldn’t translate the materials of my memories into words on the page. Part of the reason for this was that the memories were too raw and painful; people died and others went to prison. Some people disappeared into Eastern Europe and were never seen again. The leader of our squat, Wim de Wolf or Bill the Wolf was a geriatric gay man with hair like Quentin Crisp who had been in a Nazi concentration camp. When his heroin addicted lover Harry died of an overdose, Bill the Wolf went mad. We’d watch him walking along the canals with his Alsatian dog; he’d mutter and curse and spit and rage. We were too scared – or embarrassed – to talk to him and I imagine he probably died in poverty or in the madhouse. I will never know. My best friend, Jean Gerard Armando Ducochet stole our savings and gave himself up to the police when he realised what he’d done. Before he went to prison he came to see us and embraced me like a brother. That was the last time I ever saw him. The novel wouldn’t fall into place on the page, partly because it was just too autobiographical. I couldn’t get the wild sense of magic realism I was after – that hinterland were real life is disturbed by the shadow and light of dream, of fever and distortion. I wanted it to spill over into lyrical delinquency but it kept on trying to honour the facts. Ten years after leaving Amsterdam I went back for a weekend. I went back to one of the houses I’d squatted and I sat in the garden. There were roses, clematis and honeysuckle and the house was now retirement apartments for nuns. I sat there remembering the old days and comparing them to the slightly surreal present day. This was the garden where we smoked dope and buried my friend Harry’s pet rabbit and now it was a garden where sweet old ladies sat counting their rosary beads. I sat in bars on Prinsengracht and started writing a film script. It wasn’t intended to be a naturalistic film, more an art house piece or an installation. I imagined fragmented memories, flickering glimpses into a shadowy past illuminated by the glimmer of hallucination or the dark, sinister glow of subterranean night. 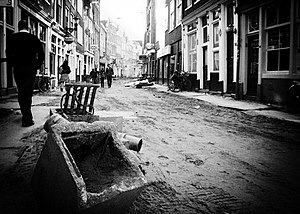 Amsterdam had always had an underbelly inhabited by dangerous characters and I tried to write a film whose edges were disrupted by these dangers. Essentially it was a love story between me and my girlfriend, between me and the city, between me and my chosen life style. When I was younger I was attracted to the edge of things; I always wanted to go a little bit too far into the dangerous part of town and the Zeedijk in Amsterdam’s Red Light District was incredibly alluring to me. 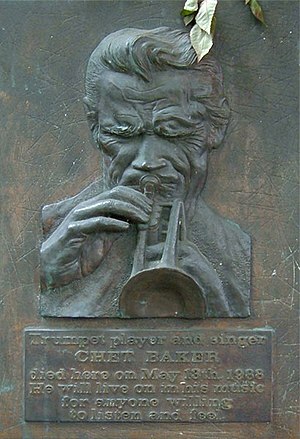 This was the street where Chet Baker fell to his death and where the canal bridges were haunted by dangerous looking Somalian smack dealers. I tried to get the sense of this thrill across in images. The only way to get a film like this made would be to go back to live in Amsterdam and re-immerse myself in the demimonde. But the demimonde wasn’t there anymore. The only place the sub cultural imagery existed was in my head. The current version of ‘Zeedijk’ is a hybrid. It is placed on the page in the form of a poem but it isn’t intended to be a poem. It’s more like a repository; a location for storage or safe keeping. It uses the same memories, images and characters as the abandoned novel and the abandoned film and the poetic structure has acted as a restricting device to keep the images in. The stanza form acts as a kind of vitrine that stops the memory escaping and getting over excited. Michael Ondaatje describes his book, ‘The Collected Works of Billy the Kid’ (3) as ‘Left-Handed Poems’. This term could be used to describe – or explain – ‘Zeedijk’ which runs in its entirety to 40 pages. It is intended to have an oblique, lateral, glancing quality and it is always a work in progress. It goes through a process of constant evolution, deletion, abandonment and interrogation. I’m not certain it stands up as a piece of art but what has been interesting for me is that it is a kind of time capsule full of words. I want these words to hint at experiences without opening up into over emphatic narrative – a sideways glance at a memoir perhaps. Part of the process of writing ‘Zeedijk’ has been abandonment. This is an eloquent and almost poetic piece of writing about everything that you WANTED to write but didn’t. I came of age in the Amsterdam you describe (moved to the USA in 1985) and I look forward to reading your novel/autobiography/short story/stories whenever you decide to sit down and get down to it. I promise to reply & send you mine (about the plague years in NYC and SF) once I complete the drafts. Believe me: I know how hard it is! Here is what I do: I just write a little bit every morning after I wake up – before I go to work, and do not edit it (that comes later, and is probably best done by someone else). Thanks for this Guy. I’ve been researching a lot about the Provos lately and its brought back lots of memories about my Amsterdam years and that climate of dissent – Anti-City, Stopera and so on. One day when I’ve got more time I’ll get back to my Zeedijk ‘problem’. Where do you live now and what are you working on? 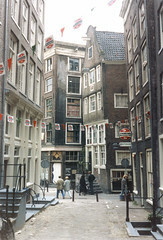 I first visited Amsterdam in 1999 on a four-hour layover on my way to Greece for a study abroad program. I was mesmerized, enchanted, even terrified a bit. A friend and I had mad arrangements to stay two extra days there on our way back from Greece. The whole month of the study abroad program, I anxiously anticipated returning to that enigmatic place. When we returned we enjoyed all the usual sights and experiences that most American tourists do, but it was’t enough. I went back to Amsterdam the two following years, each time staying longer, each time learning more about the city, exploring other cities like Haarlem, Rotterdam, Leiden, Alkmaar and even spending a night on Texel. After coming home I immersed myself in learning everything I could about the country and Dutch culture. It became an obsession. I started learning to speak dutch and constantly looked for anything more I could learn about my favorite place on earth. Almost 20 years went by before I would see my beloved Amsterdam again. This past May of 2017 I returned with my Fiancee. The city had grown and evolved just as I had. I returned feeling like a veteran, almost sneering at the tourists who were there for the first time, gawking at the city that I felt was a tiny bit mine. My love of Amsterdam and all things Dutch continues. My last visit only served to further my obsessions. The story of Zeedijk is fascinating to me. The era of seediness are well known, but to me, not specifically well documented. When I read your post here I became very interested. The “dreg end of hippy dom” is a fascinating Idea to me and I’d love to hear any memories you have. So this is one person who’d love to hear your stories. Good luck to you and your endeavors. Thanks Peter! I’ve emailed you!